For those unfamiliar with the concept of a "Hobbit Birthday", it is one where the birthday person gives presents to those who come to celebrate with him/her. And that's what I'm doing here with my birthday, which is March 30th. 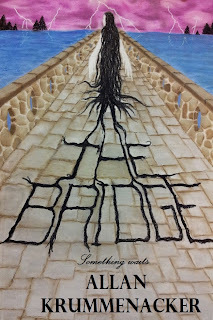 I'm giving you all a chance to get a free e-copy of my novel "THE BRIDGE". Just go the link below which will take you to Smashwords and use this coupon code: XS86Y to get a free e-book copy. Smashwords will give you selection of different versions of the book to choose from MOBI (Kindle), Nook, Apple, EPUB, and PDF. I got the idea for "Sample Sunday" from one of my fellow authors, namely Scarlet Black. 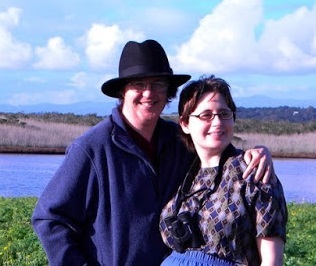 She is the author of "Wisdom Of Evil", "Salem Moon" 1 and 2, "The Last Gift" and most recently "E-Vamp" which is taking the European market by storm. I strongly recommend checking her out on Amazon folks, you won't be disappointed. Anyway, today I decided to give you all a brief glimpse into a scene in "THE BRIDGE". I thought it might be nice to show you some of what goes on during one of my lead characters psychic visions. Once you've read it, remember the book is available for all e-readers and in print. You can find all these versions at my new webpage: http://allankrummenacker.wix.com/allan-krummenacker. Just click on the one you want and the link will take you to where you need to go for it. For those who didn't already know, I have a Vlog over on YouTube. Now I know I've gained more readers over time, especially since I last posted any videos here. And those I believe were from Christmas here in Marina California. Normally my videos are all about writing and its many aspects: settings, plot, character development, getting ideas, finding inspiration, dealing with writer's block, publishing on Createspace and Smashwords, etc. Here is the latest video I posted a few weeks ago. You may want to check it out or go to my YouTube channel to check out some of the other videos I've made. I tried making this last one a bit more amusing, but without going overboard and ruining the main point I was trying to make in the video of how to make a mistake into a plus. 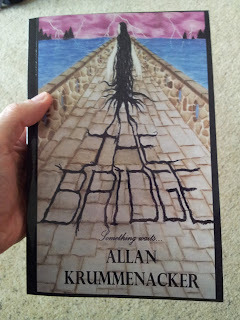 I'm down to my last five 1st edition copies of my novel "THE BRIDGE". Now, there may be more available in six months from now, but don't count on it. Last week I placed 9 of these first edition copies in two local bookstores. If they don't sell there, I'll be making whatever is left of them available for purchase here. I'm hoping I'll get cleaned out and asked to bring in more copies (those will be 2nd edition ones). So if anyone is interested in getting a personalized/signed 1st edition please let me know. I don't know how much longer these will last. Price $15.00, plus $3.00 shipping and handling here in the U. S. Outside of the U. S. will cost more. REMEMBER: These are the copies that still have some errors in them, but not enough to really interrupt the story or your enjoyment. Okay, yesterday was a big day for me. 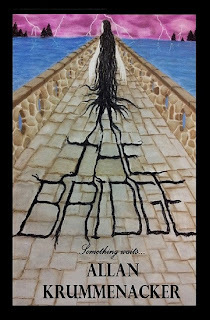 My novel "THE BRIDGE" is now available in two 'brick-and-mortar' bookstores. How did I make this happen? Are sales jumping through the roof? Is my name out there so much that fans are demanding it be available everywhere? Two words.... I WISH! I'd like to welcome my guest blogger Michael Brookes who will be discussing book covers. In particular, he'll be addressing how he chose the cover for his new book "CONVERSATIONS IN THE ABYSS". If the eyes are the windows to the soul, then the cover is the gateway to your book. Whether it is a paperback or a Kindle download, the cover is usually the first thing the reader sees. A good cover attracts the reader’s interest. Hopefully it interests them enough so they read the blurb (that’s a whole other topic!) and then purchase the book. It’s also a part of the publishing process that I enjoy. Not as much as writing the book, but it’s still a fun part of releasing a book. I’m no great artist, but as I’m writing I usually have some idea of what I want the cover to be. That’s the first stage of the process. You need something strong. The cover not only needs to attract attention, but convey what the story is about. Wow! Another 5 star review for "THE BRIDGE". And in this case, I KNOW the reviewer had one of the earlier flawed 1st editions. Most of the errors have been dealt with in the current 2nd edition (which for the record is kind of a 3rd edition really). I made changes once before and still didn't get a lot of the errors , luckily only 1 or 2 people got free review copies of that version which I was starting to call the 2nd edition. Then I went back and edited AGAIN, to create the current 2nd edition which has been gathering most of the more recent 5 star reviews.